Vonoprazan fumarate (Takecab®) is a first-in-class potassium-competitive acid blocker that has been available in the market in Japan since February 2015. Vonoprazan is administered orally at 20 mg once daily for the treatment of gastroduodenal ulcer, at 20 and 10 mg once daily for the treatment and secondary prevention of reflux esophagitis, respectively, at 10 mg once daily for the secondary prevention of low-dose aspirin- or non-steroidal anti-inflammatory drug-induced peptic ulcer, and at 20 mg twice daily in combination with clarithromycin and amoxicillin for the eradication of Helicobacter pylori. It inhibits H+,K+-ATPase activities in a reversible and potassium-competitive manner with a potency of inhibition approximately 350 times higher than the proton pump inhibitor, lansoprazole. Vonoprazan is absorbed rapidly and reaches maximum plasma concentration at 1.5–2.0 h after oral administration. Food has minimal effect on its intestinal absorption. Oral bioavailability in humans remains unknown. The plasma protein binding of vonoprazan is 80 % in healthy subjects. It distributes extensively into tissues with a mean apparent volume of distribution of 1050 L. Being a base with pKa of 9.6 and with acid-resistant properties, vonoprazan is highly concentrated in the acidic canaliculi of the gastric parietal cells and elicited an acid suppression effect for longer than 24 h after the administration of 20 mg. The mean apparent terminal half-life of the drug is approximately 7.7 h in healthy adults. Vonoprazan is metabolized to inactive metabolites mainly by cytochrome P450 (CYP)3A4 and to some extent by CYP2B6, CYP2C19, CYP2D6, and SULT2A1. A mass balance study showed that 59 and 8 % of the orally administered radioactivity was recovered in urine as metabolites and in an unchanged form, respectively, indicating extensive metabolism. Genetic polymorphism of CYP2C19 may influence drug exposure but only to a clinically insignificant extent (15–29 %), according to the population pharmacokinetic study performed in Japanese patients. 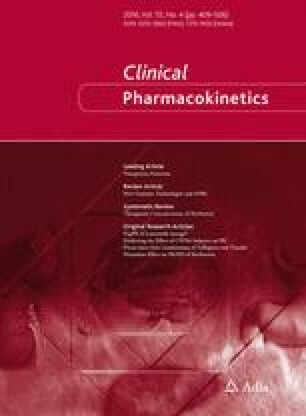 When vonoprazan was co-administered with clarithromycin, the mean AUC from time 0 to time of the next dose (dosing interval) of vonoprazan and clarithromycin were increased by 1.8 and 1.5 times, respectively, compared with the corresponding control values, indicating mutual metabolic inhibition. The mean area under the curve from time zero to infinity obtained from patients with severe liver and renal dysfunction were elevated by 2.6 and 2.4 times, respectively, compared with healthy subjects, with no significant changes in plasma protein binding. Vonoprazan increases intragastric pH above 4.0 as early as 4 h after an oral dose of 20 mg, and the extensive anti-secretory effect is maintained up to 24 h post-dose. During repeated dosing of 20 mg once daily, the 24-h intragastric pH >4 holding time ratios were 63 and 83 % on days 1 and 7, respectively. Because vonoprazan elicited a more extensive gastric acid suppression than the proton pump inhibitor, lansoprazole, it also gave rise to two to three times greater serum gastrin concentrations as compared with lansoprazole. In pre-approval clinical studies for the treatment of acid-related disorders, mild to moderate adverse drug reactions (mostly constipation or diarrhea) occurred at frequencies of 8–17 %. Neither severe liver toxicity nor neuroendocrine tumor has been reported in patients receiving vonoprazan. The author declares no conflict of interest regarding the present article. Drug approval review for vonoprazan fumarate (in Japanese), the Pharmaceuticals and Medical Devices Agency of Japan. 2014. https://www.pmda.go.jp/. Accessed 28 May 2015. The interview form for vonoprazan fumarate (Takecab® tablets 10 mg and 20 mg) ver. 3, (in Japanese). Takeda Pharmaceutical Company Limited. 2015. http://www.takeda.co.jp/. Accessed 28 May 2015. Prescribing information of Takecab® tablets 10 mg and 20 mg ver. 2 (in Japanese). 2015. http://www.takeda.co.jp/. Accessed 28 May 2015. US Department of Health and Human Services, Food and Drug Administration, Center for Drug Evaluation and Research (CDER). Guidance for industry, drug interaction studies: study design, data analysis, implications for dosing, and labeling recommendations. 2012. http://www.fda.gov/downloads/Drugs/GuidanceComplianceRegulatoryInformation/Guidances/UCM292362.pdf. Accessed 26 Aug 2015. European Medicine Agency (EMA), Committee for Human Medicinal Products (CHMP). Guideline on the investigation of drug interactions. 2012. http://www.ema.europa.eu/docs/en_GB/document_library/Scientific_guideline/2012/07/WC500129606.pdf. Accessed 26 Aug 2015.